All of these help me stand! Standing is very important because I need to bear weight into my feet, legs, and hips to keep them all working! 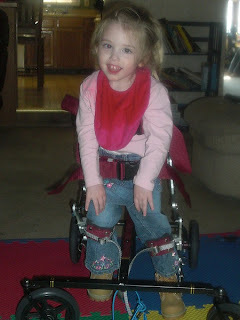 I love to be upright and moving! Most of the time my legs don't move but I try very hard! 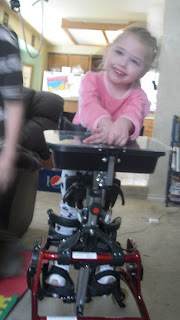 This is the Hart Walker- This walker lets me stand right next to my toys and play with my arms free. I love to stand and watch my brothers play! I also love to take it for rides down the driveway! 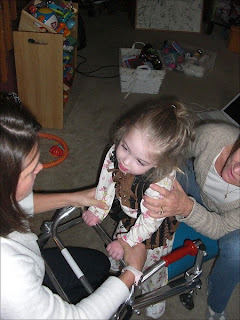 This is the Pony- This was my first walker. 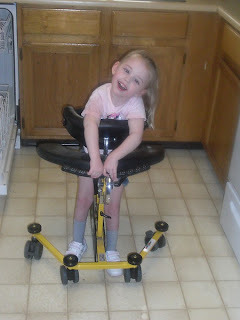 I have used this mostly to stand! I love to stand and watch TV and play with my toys! It has helped me gain strength in my neck and my legs! This is the Pacer- I really don't like this one at all! The seat gives me red marks on my legs and I really don't like holding on to the handles! This is My Mae Walker. This doesn't offer any support. 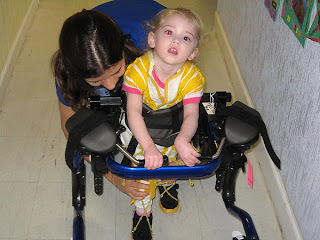 I love to hold onto this walker and work on my trunk strengh. My hips also get practice with staying in the middle. This is my Rabbit Stander. I stand in this and watch cartoons a lot! I also love it when my brothers push me around the house in it! This is not my favorite thing to be in but my mommy says that I have to be upright so that my body gets used to the feeling! One day I will walk and it will be worth all of the tears!